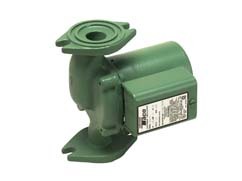 The Taco Model 008 Cartridge Circulator is designed for a wide range of residential and light commercial, higher-head water circulating applications. Available in cast iron or bronze constructionBronze can be used in higher-head heat recovery, water source heat pumps, open-loop solar heat and domestic water recirculation systems. Unique, 00 family replaceable cartridge contains all of the moving parts so you can service it easily instead of replacing the entire unit. Compact, direct-drive, low-power consumption design is ideal for high efficiency jobs.